I can't seem to open Netsight Console on Windows10/Jre8_latest. I get nullpointerexception every time. I can open InventoryManager but not Console. Any idea what should be the problem? If you check with different computer is it working ? Well, I can't try it on a different computer now. Will try it later. 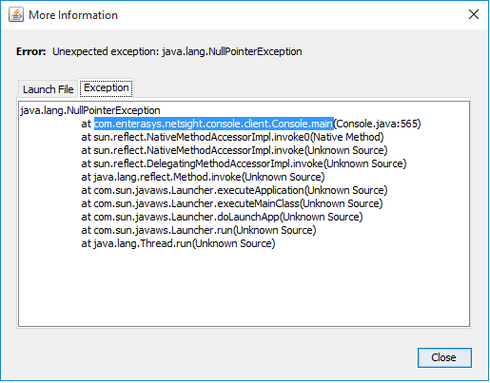 I clear all temporary java files from java settings console and retry to run console.jnlp. Still the same error. Edit: I just tried it on Windows 7 SP1 machine with java 8. Same error. Please try to change below configuration from JAVA. Please let me know if this is working. I added http://nms.artvin.edu.tr:8080 and https://nms.artvin.edu.tr:8443 to Exception Site List. Cleared all the caches. restarted NMS server. Still getting the same error. Please check how many JAVA versions are installed on this machine, if its more than 1 then uninstall the old java versions. If you have only JAVA 8 just to make sure its JAVA issue please downgrade to java 7 update 71. No, there is only one java version installed. I just removed java 8 and installed jre7u67, cleared cache and I get the same error. is a proxy server in path to nms? Nope, we don't use any proxy and as I said Inventory Manager opens without any problem. But Console gives this error. I'm going through some older threads here and wanted to ask if you still need assistance with this? Yes the problem still persists and gtac is looking into it. Okay - I'm going to keep this marked as "In Progress" for now and will check back in later unless there are updates made here first to close it out.